I’ve been enjoying the new FX series, “The People vs. O.J. Simpson,” and I’m not sure why because I hated that case passionately when it was happening in real life. I was ages 13-14 during the trial, so I’m one of the younger people who have a clear memory of it, and boy was it horrible. It was a form of national torture you could not escape, kind of like Donald Trump’s current reign of terror in the media. It was difficult to go a day without hearing about it, and there was never a day I wanted to hear about it. I’ve also recently realized that I have no interest in true crime stories. Although I wasn’t aware of it at the time, I think this is the real reason I never got into the podcast Serial when it was at the height of its popularity. Since then there have been two other big, true-crime events that I was also disinterested in: the Netflix show Making a Murderer, and Robert Durst’s confession on the show The Jinx that he’d “killed them all.” I have zero interest in watching either show. I didn’t care about O.J. Simpson’s trial either, but was subjected to it non-stop for a year and a half. I must admit, I did watch the white Bronco chase along with 95 million other Americans, so on that level I was part of the problem. It was one of the first “reality TV” moments before the phrase “reality TV” had even been coined, so it was nearly impossible not to get sucked into something so unprecedented. I also remember going into the library during 5th period during my sophomore year of high school to watch the verdict live. I was stunned that he wasn’t convicted, but I was a white girl from the suburbs, so my understanding of relations between African-Americans and the police was rather naïve at the time. When I take into account all the recent cell phone videos that show police officers shooting a black person in the back or choking them to death despite their pleas for help, I can understand why black people would have been suspicious of the police and would have been happy to see a black man get one over on the cops for once. Unfortunately, that doesn’t take into account that the man in question is fairly obviously guilty of a brutal double homicide. All of which makes me wonder, why am I enjoying watching a recreation of these events so much? I know that tragedy plus time can equal comedy, but I don’t find the show that funny. I think it’s an odd manifestation of nostalgia, kind of like sitting around with old high-school friends and being like, “Remember that time that crazy thing happened? What were we thinking? !” It’s like the whole experience is a shared memory that we’re reliving with the benefit of hindsight and distance. Remembering Kato Kaelin, Marcia Clark, Johnnie Cochran, Judge Ito and the assorted cast of characters is like remembering that flaky guy from drama club with the hair or that girl in your AP English class who was really into Mock Trial. Even if they drove you crazy, there is some joy in remembering teenage antics that were tumultuous at the time but now are memories you can view without experiencing the same level of emotion you had while they were happening. It’s also amusing to see who has been cast as each character. Many of the actors are so well known to me that I’m seeing them more as themselves than as the person they’re playing. I don’t see Robert Kardashian, I see Ross from Friends pretending to be Robert Kardashian. You never know who’s going to pop up next either. I was watching the episode with the Bronco chase when I suddenly realized Malcolm Jamal Warner was playing the getaway driver. Then Nathan Lane showed up as F. Lee Bailey with that guy from Northern Exposure playing a geeky DNA expert. It’s particularly odd because several of these actors were pretty high-profile in our culture in 1994. That’s the year Pulp Fiction was released, so John Travolta was in the middle of a career comeback and the TV show Friends was a national phenomenon, which makes me wonder what would happen if the Kardashian kids tuned into an episode after their Father’s Day brunch. It’s almost like they’re winking at the audience and saying, “I’m not Robert Kardashian, but I play him on TV.” It’s like they’re aware of how absurd this costume drama is on some level. If the whole thing was fiction, would we find it believable? Fiction has to make sense. Real life does not. I’ve also been learning things about the case that I hadn’t known before. I hadn’t know that the Kardashians were friends of the Simpson family. I’ve never understood why the Kardashians were famous, but I suppose that’s as good of a reason as any. It’s also interesting that Simpson won his case by claiming racial discrimination by the police, but in reality he was friendly with the police and most of his other friends were rich white guys. 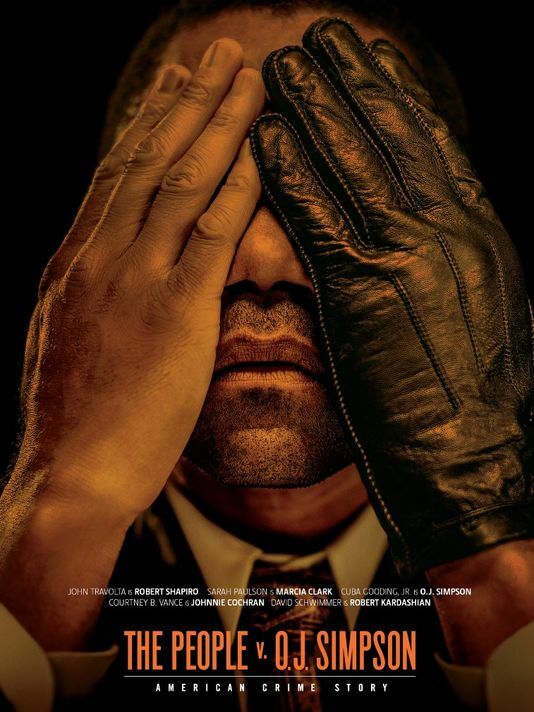 The show is based on a book titled The Run of His Life: The People v. O. J. Simpson by Jeffrey Toobin, which I admit I bought on Kindle and have been making my way through as I’ve watched the show. The book is compelling and provides even more details about the trial, though it’s easy to pick out which parts of the book have been used in the TV adaptation. The TV show is actually an anthology series with the umbrella name “American Crime Story,” so next year they’ll be covering some other true crime. I doubt I’ll be interested in whatever they cover as much as I’m enjoying the Simpson series. However, just typing the word “enjoying” when discussing the butchering of two people makes me feel guilty. One of the saddest things about these true-crime stories is that the murderer is the one who gets all the attention, when his or her victims are barely remembered. After all, it is The People vs. O.J. Simpson not The Murders of Nicole Brown Simpson and Ronald Goldman. Later: US Postal Service: Matchmaking division? Earlier: Have I been ghosted? Meg, are you out there? Like you, I am not a “fan” of true crime shows. The last couple weeks, I’ve been watching “Grace Under Fire” (Brett Butler)–kind of the same “why am I doing this?” feeling, but it’s coincidental because they mention OJ about every third show. I am about ten years older than you, and I have similar reactions — sort of “I remember where I was when I saw that” moments as I am watching. It was a very tumultuous time in my life and the two major events (the Bronco chase and the verdict) broke on “big days” for me, so that plays a role. re: the question of whether or not African Americans believed the police — I remember being just as stunned as Marcia Clark back then that anyone would claim the police were somehow at fault. One of the moments of vertigo for me in watching it now is realizing, oh yeah, they had tons of reasons to think that (even if it is not applicable in this particular case). So they really should have picked character actors that are not readily familiar/recognizable. Interesting. They probably thought they were attracting numbers with known actors. It is surprising the names you mentioned WANTED to do that show. I am not watching. I too still have not recovered from the trial when it happened. And that as just what I got accidentally exposed to, I did not watch either. Had no idea about the Kardashians (spell check had their name listed, that says a lot). And I get so over exposed to them too. Trump is good example too. And it says a lot if I am over exposed, because I only watch recorded things and I blink through all commercials. I do watch the local and national news. That is where I am getting Trumped out. And it is very interesting to me, who thinks Trump is ridiculous, that when I talk to older women, Trump is their guy, they think he is wonderful. I have learned to say – if he does have the skill set needed to solve problems, then he needs to show he can be respectful/presidential and he needs to show he understands and can uphold the constitution. If he just fires everyone, continuouly, he won’t get anything done either. The older ladies then say – well, you have a point. . .